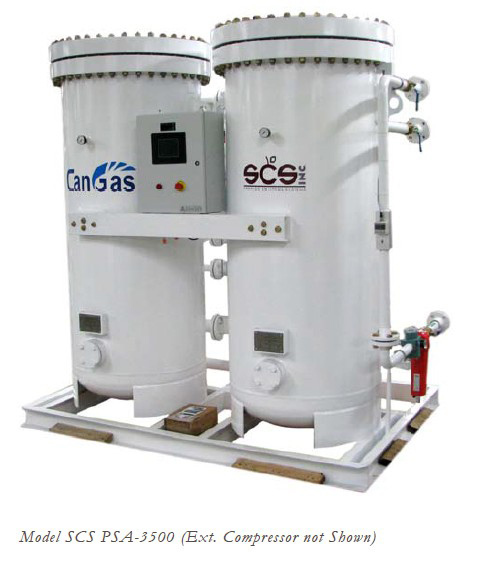 The various models of PSA nitrogen generation systems offered by SCS generate nitrogen at purities ranging from 95 – 99.999%, with a max pressure drop of only 1 bar. Various sizes are offered with flowrates ranging from 5cfm to >200cfm in order to meet your specific nitrogen needs. Add the convenience of making your own nitrogen! Regardless of your operation, if you need nitrogen and you don't currently have an on-site nitrogen generator, now is the time to consider investing in one. By having an on-site PSA nitrogen generator, also known as a Pressure Swing Absorption nitrogen generator, you can save your company valuable time and money, and here at Storage Control Systems Inc. we can help you with that. By utilizing the latest PSA technology we have developed a nitrogen generator capable of separating nitrogen from other gases found in the air in a cost efficient manner. By having this generator on-site, you can save thousands of dollars a year on bulk nitrogen purchases. In addition, our nitrogen generators are complete systems and ready to hookup. Once it is switched on, you have a supply of nitrogen at your finger tips, and you'll find that maintenance is a simple process of changing filters. Our nitrogen gas generators provide you with a continuous flow of nitrogen with purity rates from 95% to 99.999% depending on your needs. Also, our generators use a 2-stage process which includes absorption by a carbon molecular sieve and regeneration. No matter what you need a PSA nitrogen generator for, we have a model that will fit your needs and budget.